Garage equipment and power tools can burn a hole through the wallet, but if you properly maintain them throughout the course of their lives, they will return the favor. The trick to getting the most out of your tools is to store, clean and maintain them. This way you will save both time and money and become more productive during your DIY sessions. The advice you find in this article will apply to most hand and power tools. So read on to learn neat tips and trick behind power tool maintenance. At the heart of properly maintaining your power tools is finding intuitive ways to safely store them. A great way to make the most out of storage space in your garage is to install pegboards to store your power tools. You can also store in the chests, boxes or bags, whichever works for you. 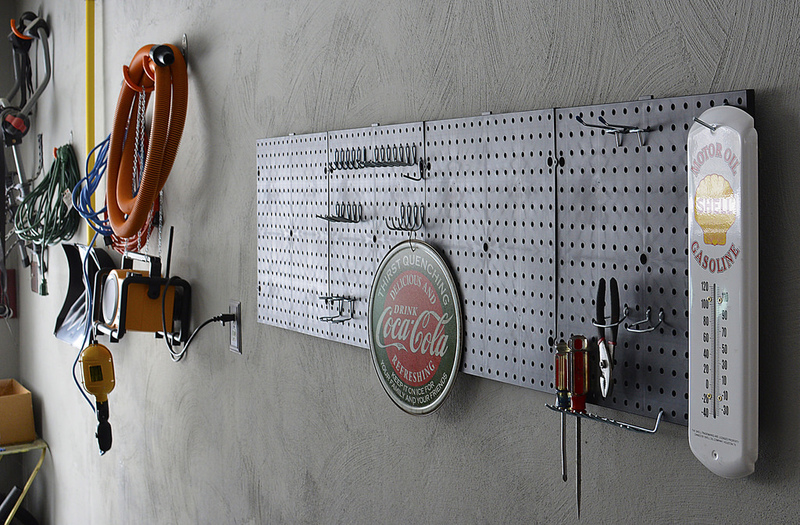 Pegboards are efficient at storing an assortment of tools, ranging from cordless drills to an entire set of wenches. Rolling pegboards are a good option for people who do not have walls with enough space for regular pegboards. But if you’re really concerned about mobility, then toolboxes will make for a great ally. The main issue with tools is the buildup of rust. Make sure you store your tools in a dry area. Garages are ideal spots to store tools, but they usually have high humidity levels. If you’re keeping the bulk of your expensive tools in your garage or basement, consider outfitting installing a dehumidifier to keep high humidity levels under check. Humidifiers are not very expensive, especially when you compare them with your range of tools. Most of them come with sensors that only turn the dehumidifier when moisture levels climb up beyond a certain threshold. The original case that comes with your power tool is an ideal place for storage. They provide adequate protection from humidity and are generally resistant against spills, drops and other types of damage. This is especially true if you do not have a climate controlled workshop. Silica gel packets can be distributed in areas where you know moisture levels are high. They are especially good at protecting power tools. Just toss them into toolboxes or drawers and you can stop worrying about rust buildup. Another good option is to buy rust inhibitors for drawers and cabinets. The last thing anyone wants to do is clean up their tools after tiring themselves out, yet cleaning the tools is critical at keeping them in good shape. All it takes is a few seconds for every tool unless you’re dealing with something excessively dirty. You can clean most hand tools by wiping them with a soft rag coated with WD-40. Cleaning power tools are slightly trickier. Your first order of business is to unplug the cord. Now wipe off the dust, an air compressor will get the job done just fine. Now lubricate moving parts of the tools. Always read the instruction manual to see which lubricants are to be avoided. Garage101 is your go-to place for buying and renting power tools. Find your favorite items at market-competitive prices here.